I love a good Caesar salad, but I never order them at restaurants because the dressing is always way too salty. They’re great to make at home because they are so easy to put together and best part – you can control what goes into your dressing! I use anchovies (classic Caesar dressing ingredient) which punk a big punch of salt and flavor, so I do not add any extra salt. Preheat oven to 350 degrees. 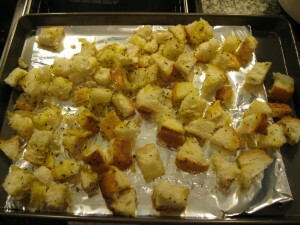 Prepare croutons by cutting up bread into bite-sized chunks. Spread on a foil-lined baking sheet. Drizzle with olive oil (about 2 tbs. ), then season with spices (about ½ tbs. of each spice). Mix with your (clean) hands. Put into the oven to bake for 5-8 minutes or until crisp and lightly browned. Remove from the oven and allow to cool. 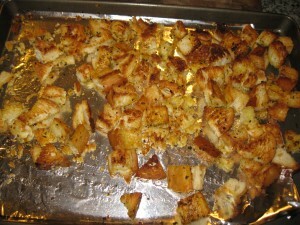 While croutons are in the oven, heat a large fry pan over medium heat. 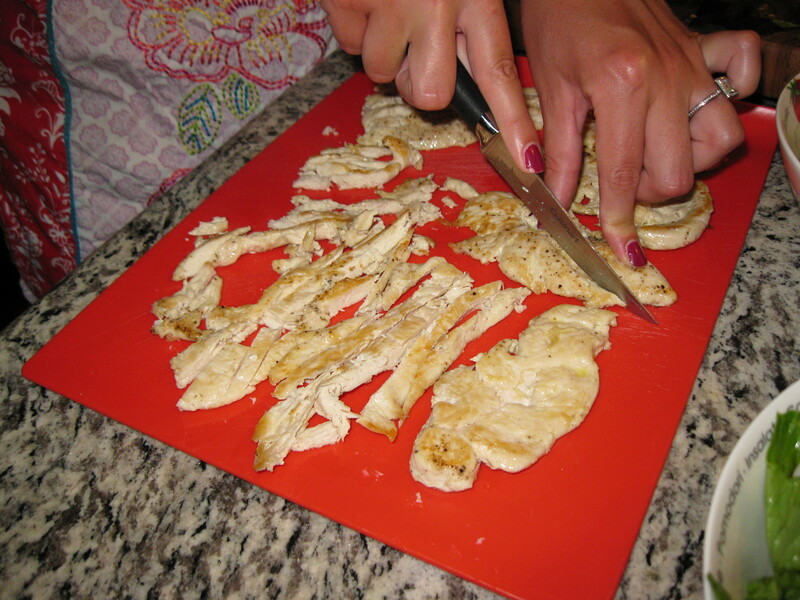 Prep chicken by pounding it thin with the flat side of a meat tenderizer. Add oil to pan. Season both sides of chicken with salt and pepper. Reduce heat on pan to medium low (seven o’clock on the dial) and add chicken in a single layer. You may need to cook chicken in two batches. Cook on each side for 3-5 minutes, then flip. Chicken is donewhen outside is entirely white (just hints of browning on the outside). You can also cut into the middle of a breast to check for doneness. Inside should be white and moist. If it is pink or clear white it is not done and needs to cook longer. Once cooked, remove from pan and lay on plastic cutting board. Slice chicken into thin strips and allow to cool to room temperature. 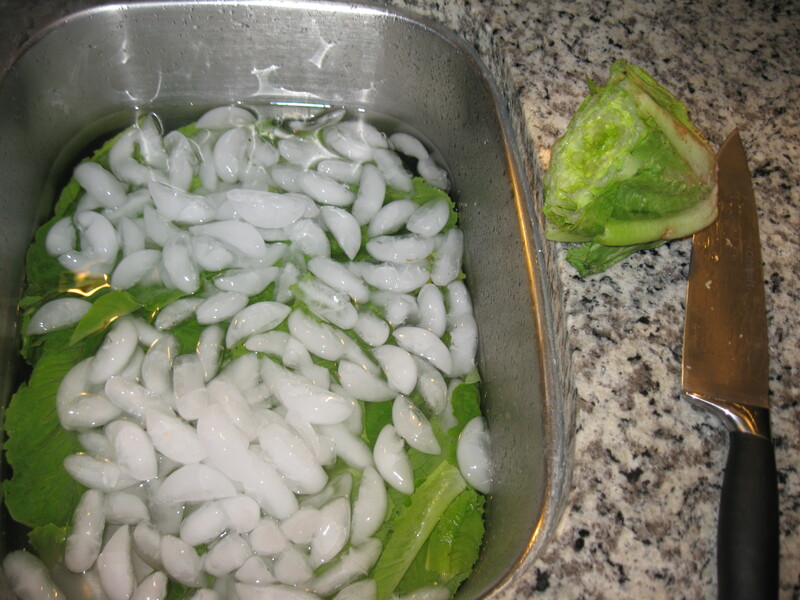 Make dressing while chicken cooks and lettuce soaks. Add mayo, parmesan, and lemon juice to blender. Coarsley chop anchovies and garlic and add to blender. (You want to chop them up prior to blending so that you ensure there will be no big chunks of raw garlic in anyone’s salad.) 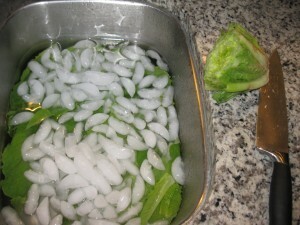 If you happen to have a bottle of white wine open you can add a splash to your dressing. 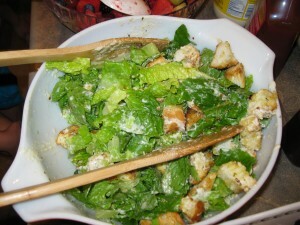 Combine lettuce, chicken, croutons, and dressing in a large bowl. Toss to combine and serve!